Improve the academic achievement of English learners. The SIOP® Institute I helps educators teach English learners both content knowledge and academic language skills. During the three-day workshop, participants will gain practical skills to collaborate, share, and implement lesson plans. The structured approach lets all participants experience the 8 components and 30 features of SIOP®. Based on years of research, the Sheltered Instruction Observation Protocol (SIOP®) Model is a scientifically validated framework for improving the academic achievement of English learners. 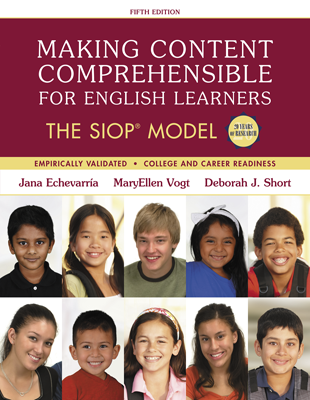 Developed by Dr. Jana Echevarría, Dr. MaryEllen Vogt, and Dr. Deborah Short, the SIOP® Model assists thousands of educators, including administrators, specialists, coordinators, and teachers. Select a snapshot below to review SIOP® results from some of our school partners. SIOP® Institute participants will gain an in-depth understanding of the SIOP® Model, the research, and the included content. Practice is provided for each of the eight SIOP® components. Institute attendees will also receive a brief introduction to lesson planning with the SIOP® Model. The SIOP® Model Training Manual. Early Bird Discount: Receive $50 off each registration when you sign up two months in advance. Example: Register with form of payment by June 1st for an institute that begins August 1st. Team Discounts: Receive $100 off each registration when you enroll four or more participants in the same institute. A minimum of four registrations needed for discounts.